For almost a half a century, scholars and practitioners have debated what the connections should be between public administration and the public. Does the public serve principally as citizen-owners, those to whom administrators are responsible? Are members of the public more appropriately viewed as the customers of government? Or, in an increasingly networked world, do they serve more as the partners of public administrators in the production of public services? This book starts from the premise that the public comes to government not principally in one role but in all three roles, as citizens and customers and partners. The purpose of the book is to address the dual challenge that reality implies: (1) to help public administrators and other public officials to understand the complex nature of the public they face, and (2) to provide recommendations for how public administrators can most effectively interact with the public in the different roles. 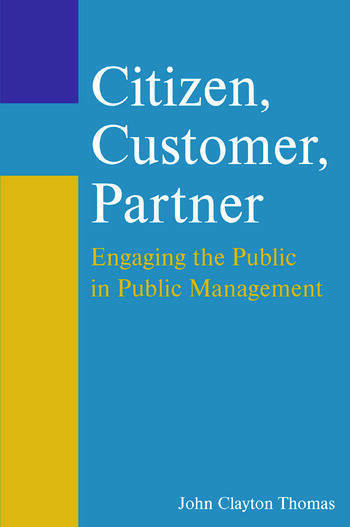 Using this comprehensive perspective, Citizen, Customer, Partner helps students, practitioners, and scholars understand when and how the public should be integrated into the practice of public administration. Most chapters in Citizen, Customer, Partner include multiple boxed cases that illustrate the chapter’s content with real-world examples. The book concludes with an extremely useful Appendix that collects and summarizes the 40 Design Principles – specific advice for public organizations on working with the public as customers, partners, and citizens. With three books and more than fifty articles in print, John Clayton Thomas is known internationally for his research on various aspects of public management and public policy. Much of that research focuses on how citizens connect with their governments and how those connections can be improved – for instance, how citizens interact with governments through the medium of "e-governance" and how citizen input can be incorporated in performance measurement. Dr. Thomas's research has appeared in Public Administration Review, the Journal of Public Administration Research and Theory, Administration & Society, Urban Affairs Review, and the Journal of Urban Affairs, among other journals. He also serves as one of three Editors of the American Review of Public Administration, one of the elite journals in public administration.